Combine old school Chicago blues, jazz, and a bit of funk, and you stumble upon Blues Union, featuring veteran players Carswell and Rudolph with their debut release, Extra Blue (Burnt Skillet). Keyboardist/vocalist John Carswell and guitarist Zane Rudolph met three years ago at a music shop. After hearing John work his magic at the B-3 (that was set up in the store), the two became quick friends and formed Blues Union. Each coming from a blues and jazz background, these guys offer an eclectic and satisfying mix of music. Having worked with the likes of B.B. King, Leon Russell and Ray Charles, Carswell is no stranger to the blues, and his soulful voice is convincing evidence. Equally as impressive, Rudolph has worked with Stan Kenton Neophonic Orchestra, Ike and Tina Turner and the Shirelles. The skillful musicianship and years of experience between these two guys, combined with a very tight band, manufacture Blues Union's dynamic sound. One of five originals, "Touch Me," begins with boogie-woogie style piano, which leads into a fun-filled shuffle. Unyielding solos from saxophonist Dan O'Steen and the clean guitar work of Rudolph are showcased. Funk savoir-faire is featured on the track, "Feels So Bad," bring to light tight arrangements with fat Hammond chops and fills. The classic "Hard Times" slows things down, as John's well-traveled vocals become the focus of this track. "Lover Man" is six minutes of "put your feet up and relax" jazz. The stellar saxophone work is complimented by Rudolph's savory guitar playing. 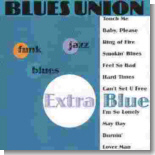 Diversity is one reason why Blues Union has gained a loyal fan base. The mixture of styles on this recording is well put together as each track leaves the listener in anticipation of the next. The talent, experience, and soul of Carswell and Zane are put into each and every song on this disc, which makes the entire disc a genuine listening pleasure.